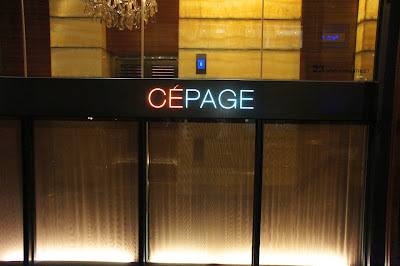 Cepage is a 1-Michelin star French restaurant in Wanchai, Hong Kong, along a steep street just next to Pacific Place 3. This dinner would be our third time here, once for dinner in 2009 and the other for lunch in 2010 (see earlier review: Cepage July 2010). This time, we were here for dinner and we got to the restaurant early. The receptionist at the door was really enthusiastic and insisted that we should check out the rooftop bar, where they had an open air seating area and nice music. Unfortunately, it was just too cold (under 10 degrees C) and terribly windy as well, so our time upstairs was short-lived. Nonetheless, it looked like a cool place to hangout in the warmer months. We were seated at the corner next to the window (same place as last time) and served with some bread and nibbles. We ordered some champagne by the glass (Krug Brut) which, when we got the bill after dinner, turned out to be super expensive. It was a small quantity, half of what we usually get at comparable restaurants, and easily double the price at least. But we didn't know this at that time, though we will remember to skip the champagne the next time we are there. 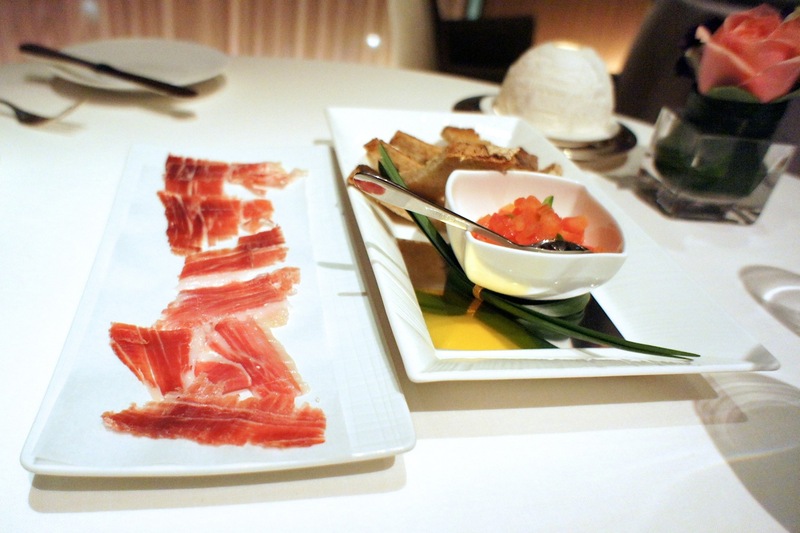 We ordered a plate of Iberico ham, which was accompanied by a plate of bread and salsa. This seems to be a staple of Cepage, as we've had this each time we were here and there's always a leg of aged ham in the middle of the dining room. It wasn't so special this time, perhaps because we overdosed on wonderful Spanish ham the last we were in London a few months ago while dining at Iberica on Great Portland Place (ended up going there twice in less than 24 hours). 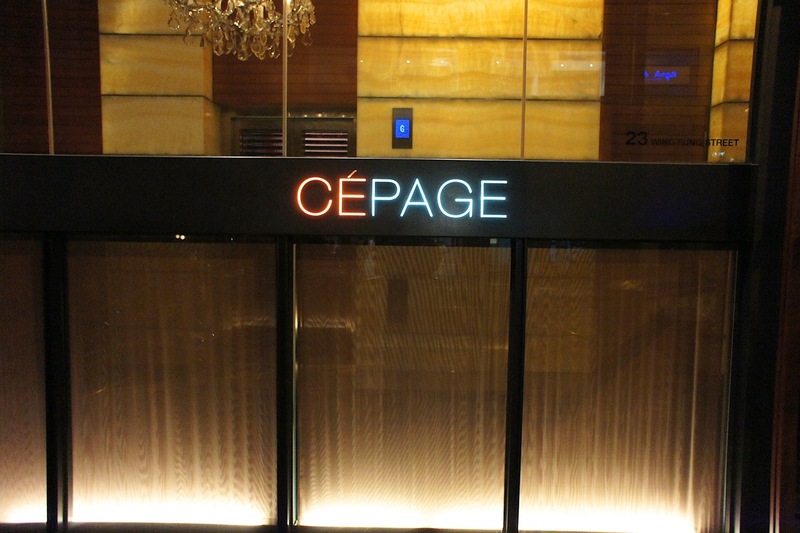 Cepage has an amazing wine list. The selection of French wines here is comparable with many top restaurants in France. 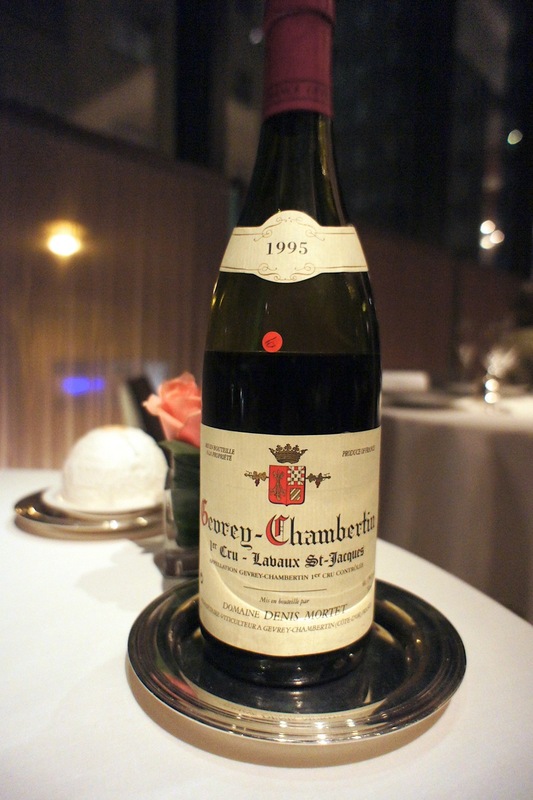 I picked out a 1995 Gevrey Chambertin Premier Cru Labaux St-Jacques from Denis Mortet (one of our favourite Burgundy producers) which was a bit of a find, and it did not disappoint. It was very mature, complex and in the robust style which we like in the Mortet Gevreys. 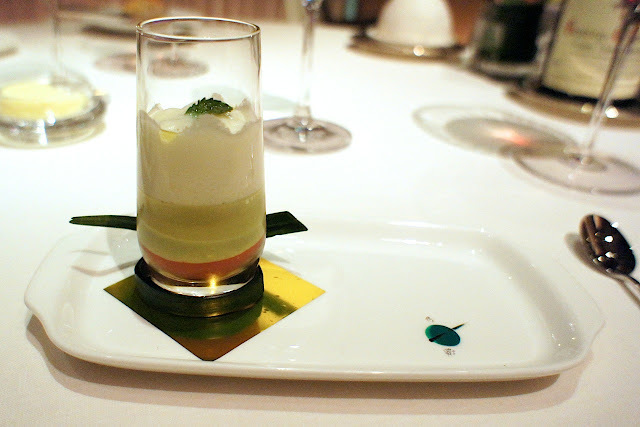 Amuse bouche was a shot glass with a layer each of tomato puree, avocado puree and clear tomato essence topped with yoghurt foam, which we thought was too sour (too much tomato in the recipe, as well as the yoghurt. The avocado did not do enough to balance off the flavours), and hence was rather disappointing. For our first course, my wife ordered the Brittany blue lobster in turnip wrap, diced vegetables, lobster sauce with touch of vin Jaune du Mont d'Arbois. The lobster was firm and juicy, and the lobster sauce with wine reduction was rich without being overbearing. It was a great dish. Mine was the crispy black truffle tart with soft caramelised white onion and egg of quail dome. I initially had some reservations about whether black truffles would taste the same again after our excessive eating of white truffles barely 3 months ago in Alba, but I was pleasantly surprised that the truffles actually went very well with the sweetness of the sliced caramelised onions beneath. 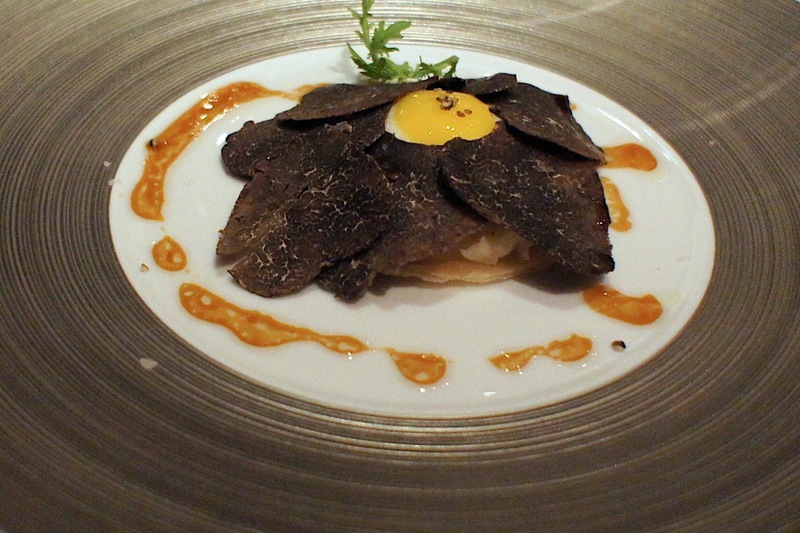 It was an innovative and delicious dish which gave me new ideas of what to pair truffles with. 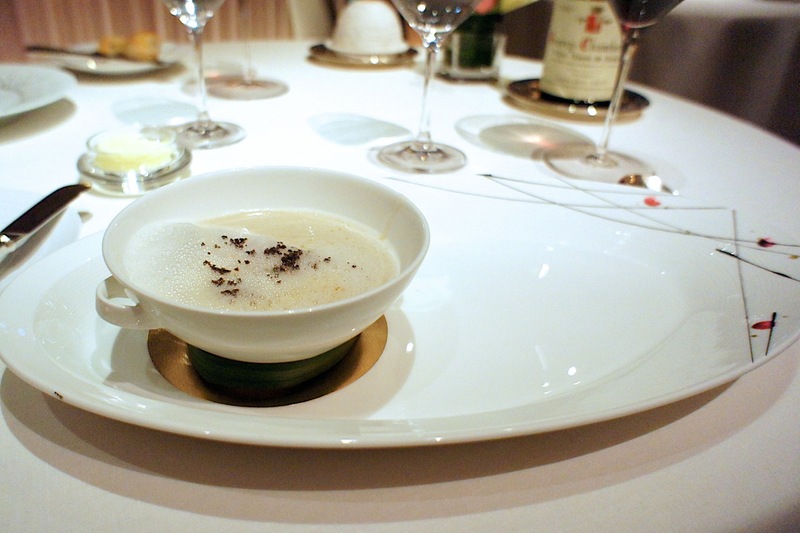 We then had the chestnut soup with pan fried foie gras, bacon and virtual cappuccino. This was good without being noteworthy. 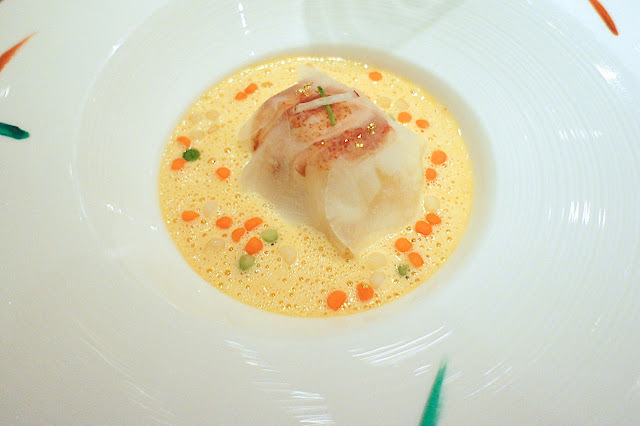 The frothy sweet and soft chestnut soup was a good base for the savory foie gras and bacon. It was the main course which was the piece de resistance. 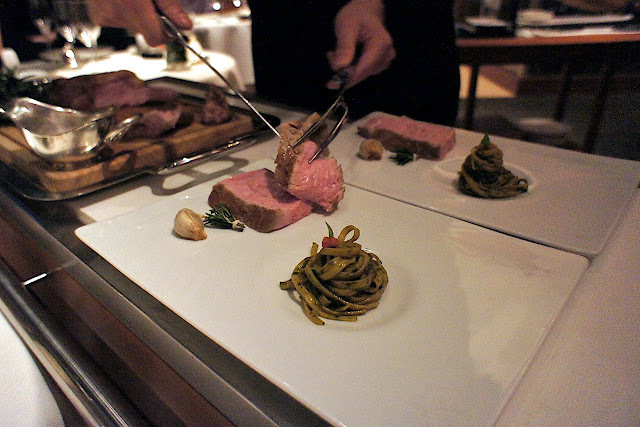 The roasted veal from Limousin accompanied by pesto tagliatelle and salad was a main course to be shared between 2 persons, and we were initially rather hesitant in ordering it given the over-hyped Limousin veal I had at Ducasse in London recently (see earlier review: Ducasse), but the waiter vouched for its supremacy. 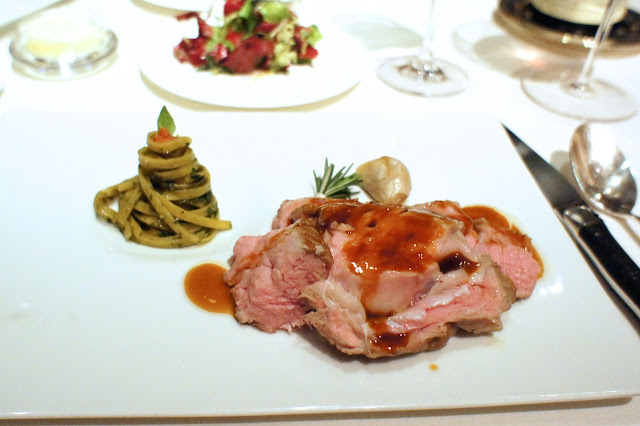 The veal was wheeled out in a serving trolley and cut in front of us. Even then we could tell that it was something special. The meat was cooked to perfection: pink inside without being bloody. Words don't do any justice to just how good this was (but I'll try anyway); the meat was succulent and tender and the sauce was heavenly. The pesto pasta was quite a pointless accompaniment though, and I didn't bother with it at all (don't like pesto anyway). We'll come back again just to eat this. 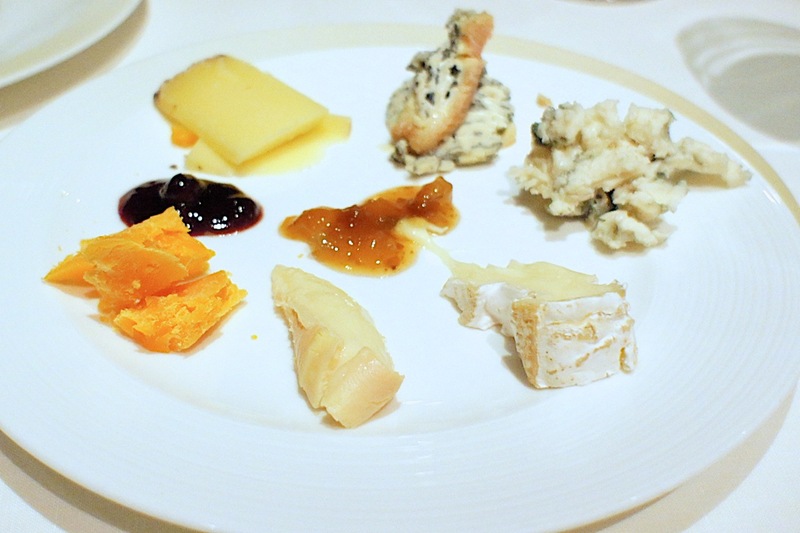 Cepage had a good selection of classic French cheeses, and we ordered the usual mimolette, roquefort, comte, epoisses and a few others. Dessert was also particularly impressive. 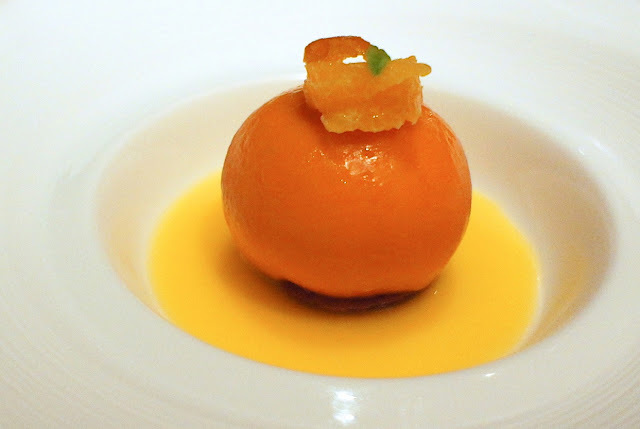 We ordered the Clementine (mandarin orange) which was a round ball which looked exactly like a mandarin orange; it was stuffed with panna cotta. What made this dessert amazing was that the outer layer tasted like a hard jelly of sorts, with a texture reminiscent of the orange peel, but softer and not bitter. It was the perfect fruity dessert to round off the meal. Petit four was a simple affair, but we were already very satisfied with our meal by that point. Another great meal at Cepage. 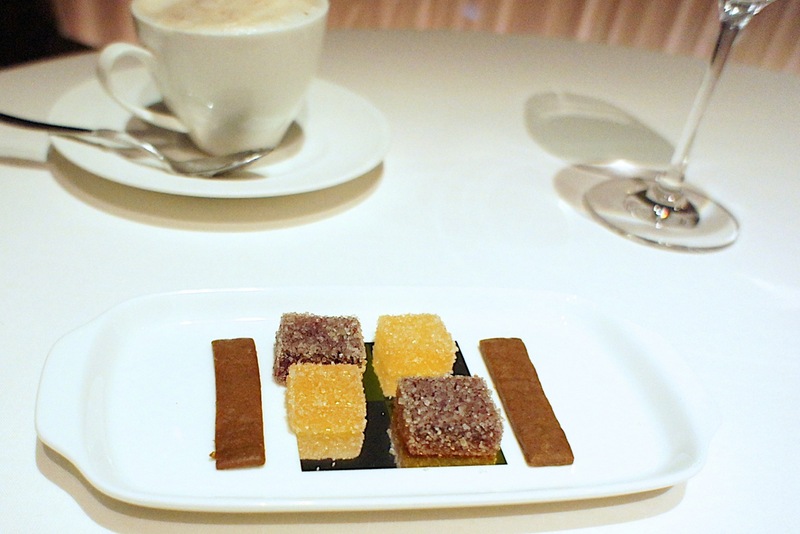 Final Thoughts: A very consistent restaurant, Cepage is a solid one Michelin star restaurant. It was another good meal here this time, with special mention to the Limousin veal and the clementine dessert. It also has one of the more impressive wine lists we've seen in Asia, especially if you like the Burgundies (though their champagnes by the glass are very expensive). Service is attentive though at times can fall short of that which you'd get from a three Michelin star establishment.